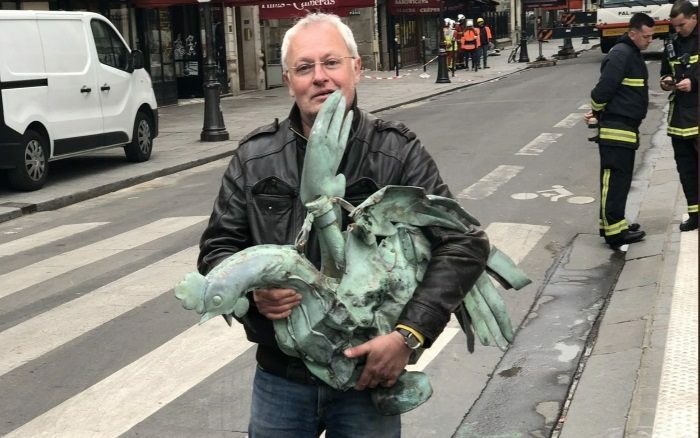 The metal rooster which perched on the top of Notre Dame’s spire was found in the rubble on Tuesday and appears to have been spared the worst of the fire. “It is dented but properly restorable,” a Ministry of Culture spokesman said of the rooster, which contains three relics that may also have survived the blaze. As the rooster was partially crushed when it fell off the spire, the extent of the damage to its contents is unknown. Stored inside the rooster is one relic of St Denis, one of St Genevieve and one of the thorns from the crown that Jesus Christ wore at the Crucifixion.